(Bloomberg) -- Tony Romo, the former Dallas Cowboys quarterback turned TV commentator, is reportedly seeking to become the first $10 million-a-year sports analyst. 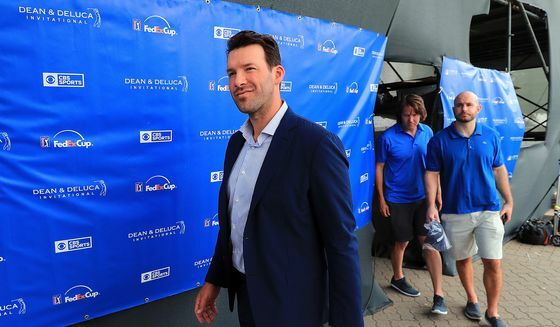 Romo’s representatives are pursuing a contract extension from CBS Sports that would pay him eight figures annually, according to the Sporting News, which cited unidentified people familiar with the matter. Such a deal would vault the color commentator to the top ranks of sports media -- after less than two years on the job. Still, the money would be dwarfed by the amount he earned as a player. In 2013, he signed a six-year, $108 million contract extension with the Cowboys. Romo developed somewhat of a cult following last season because of his ability to predict plays before they happened. It reached a zenith during the American Football Conference title game between the Kansas City Chiefs and New England Patriots, when he correctly called five different plays in the game’s final minutes. Representatives for Romo and CBS Sports didn’t immediately respond to requests for comment.